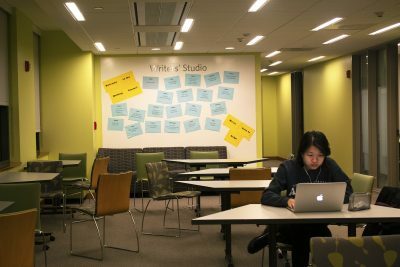 Along with the introduction of the new BU Hub general education program in the fall, Boston University introduced a revised version of the WR150 freshman writing seminar, called WR152 courses, that puts more of a focus on integrating multimedia skills to students. These WR152 classes are not a replacement for the existing WR150 format, but are another option for students to choose from. As with all of the freshman writing seminars, students are able to choose from a variety of class subjects. The WR152 classes will involve exploring the seminars’ topics using a format other than the research essay. These changes are a result of the introduction of the BU Hub, a new university-wide general education program that, according to the BU Hub website, emphasizes working across disciplines to develop six essential capacities. The new program was officially instituted in the fall 2018 semester. BU’s Class of 2022 will be the first class held to the graduation standards of the new hub curriculum. WR152 classes give students a Digital/Multimedia Expression Hub credit in addition to the Writing, Research, and Inquiry and Research and Information Literacy credits that students get from the standard WR150 courses, according to Eric Jarvis, the program manager of the BU Hub. BU professors from the Writing Program have embraced this new curriculum. Marisa Milanese, who teaches a WR152 course called BU and the Culture of College, said that her teaching has been moving in a multimedia direction for a while, so this course was a good fit for her. “I see how intelligently and enthusiastically students engage with different forms of text, with different media, and thought, ‘OK, let’s go for it and make it happen at the 152 level’,” Milanese said. Milanese said she and her class have really been enjoying this new format. Her students have already gotten experience with digital media by creating man-on-the-street-type video interviews. Other Writing Program professors, including Gavin Benke and Rebecca Kinraide, said they chose to teach WR152 because their topics worked well in that format. Benke added that he thinks instruction in multimedia texts is beneficial because they are becoming more and more present in our lives and, therefore, have a greater impact on students. Kinraide, who teaches a WR152 course called Citizen Science, said her students work through a variety of genres. Kinraide said it’s important for students to have this type of exposure to genres besides argumentative essay writing, including oral, digital and multimedia communication. She added although she likes the variety of the class, she is aware that students don’t learn as much about academic essay writing. Kinraide said there is a difference between the way students already use digital media and the skills they need to use them effectively, and that’s what these courses are teaching. Kelly Murtagh, a freshman in the School of Hospitality Administration, is taking a WR152 class this semester and said the class is good for fulfilling Hub credits and learning transferable skills. “It’s good because we get another Hub unit out of it, and we learn the skills we that we can use in other classes in the future,” Murtagh said. Matthew Segalla, a sophomore in the College of Communication, said he thinks this new format is an improvement from the old WR150 classes, which he said could have benefited from a greater emphasis on multimedia studies. Chris Capaccio, a freshman in the College of Arts and Sciences who is currently taking a WR152 class, wrote in an email he thinks these classes present a problem for students who don’t have access to the necessary technology. While I recognize this won’t help in classroom situations, lab computers running Adobe Creative Cloud are available in Mugar Library.